Several newly branded SWell Cycles have already hit San Antonio's streets near Hemisfair. San Antonio BCycle is changing its name to SWell Cycle after Steward Health Care System became the title sponsor of the San Antonio Bike Share system. The three-year sponsorship is something bike share organizers tried to secure for several years. Steward Health Care is a Boston-based company that recently acquired San Antonio’s Southwest General Hospital. The company is now the title sponsor of San Antonio’s bike share system. The full amount of the sponsorship was not disclosed. Tom Makenzie is a board member of San Antonio Bike Share, and he says Steward wanted a bigger presence and footprint in San Antonio. “They decided to use a sponsorship of the bike share system as a way to positively impact San Antonio with its health care mission,” he said. McKenzie said SWell Cycle will still use BCycle bikes but the branding will change. “By March 1, we’ll roll out a new local app and website under SWell Cycle,” he said. B-cycle cards will still work in San Antonio and other cities where BCycle is present. 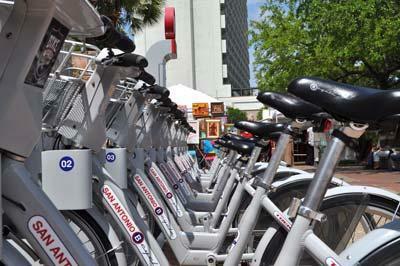 San Antonio Bike Share began in 2011. According to San Antonio Bike Share officials, the system initially had 140 bikes and 11 check-out kiosks in and around downtown; it saw about 24,000 trips taken that year. It has grown to 525 bikes in 62 stations with about 52,000 annual members and counted 136,000 trips on its bicycles last year. SWell Cycle plans to move up to 65 stations and about 570 bikes this year. The west side of San Antonio is a predominantly Hispanic, economically underserved, yet historically and culturally rich neighborhood. It’s also a bike desert. A dockless bike sharing system could be coming to San Antonio as part of a pilot program between the city and San Antonio Bike Share, operator of San Antonio B-Cycle system.